On Thursday March 12, at approximately 3:08 pm, Deputy Kristian Valdez and Deputy Patrick Bradford responded Business 287 H south of Old Gun Club Road in reference to a Criminal Trespass. Upon arrival, the Reporting Person reported that there was a vehicle driving around on his property. A 33-year-old female was barred from the property. On Thursday March 12, at approximately 8:46 pm, Lieutenant George Robinson, Sergeant Sergio Teruel and Deputy Ralph Burdick responded to the 6700 block of Geronimo in reference to a stolen vehicle. Upon arrival, a stolen vehicle was recovered. On Friday March 13, at approximately 1:47 am, Deputy Brandon Mason made a traffic stop in the 3100 block of Lawrence Road. The 30-year-old male driver was placed under arrest. He was transported to the Wichita County Detention Center and was charged with Possession of a Prohibited Weapon. On Friday March 13, at approximately 2:46 am, Sergeant Carl Magee, Deputy Greg Wilson and Deputy Lance Brumley responded to the 7700 block of Seymour Hwy. in reference to a Burglary of a Habitation. Upon arrival, the Reporting Person reported that an unknown person(s) entered the residence and stole a television, a purse and then stole two vehicles that were parked outside of the residence. A short time later, one of the vehicles was recovered in the 1600 block of Lucille. A 19-year-old male was placed under arrest. 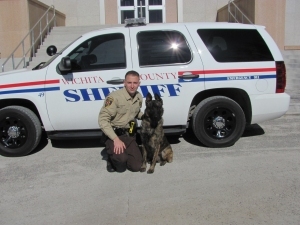 He was transported to the Wichita County Detention Center and was charged with Engaging in Organized Criminal Activity-Burglary of a Habitation and two counts of Engaging in Organized Criminal Activity-Theft over $20,000.00 under $100,000.00. The second vehicle was recovered on Byrne Place. Most of the stolen property has been recovered at this time. On Wednesday March 11, at approximately 9:48 pm, Sergeant Sergio Teruel, Deputy Ralph Burdick and Deputy Roy Biter responded to the 8200 block of Tica Road in reference to a Disturbance. On Wednesday March 11, at approximately pm, Deputy John Warner and Eric Wisch responded to Fenoglio Street to serve an arrest warrant. Upon arrival, a 21-year-old female was placed under arrest. She was transported to the Wichita County Detention Center and was charged with Possession of a Controlled Substance PG 1 over one gram under four grams. On Thursday March 12, at approximately 2:19 am, Sergeant Carl Magee made a traffic stop in the 3200 block of Lawrence Road. The 39-year-old male driver was placed under arrest. He was transported to the Wichita County Detention Center and was charged with Driving While Intoxicated-Enhanced. On Monday March 9, at approximately 10:13 am, Deputy Chris Barnett made a traffic stop in the 1100 block of Polk. The 22-year-old male driver and a 19-year-old passenger were placed under arrest. They were transported to the Wichita County Detention Center and were charged with Possession of Marijuana under two ounces. On Tuesday March 10, at approximately 3:02 pm, Deputy Roy Biter responded to the 400 block of Rifle Range Road in reference to a Theft. Upon arrival, the Reporting Person reported that an unknown person(s) broke off a lock to a metal storage container and stole a Lincoln Wire Welder valued at $4,500.00. On Monday March 9, at approximately 11:19 am, Deputy John Warner made a traffic stop in the 1400 block of Holliday. The 21-year-old female driver was placed under arrest. She was transported to the Wichita County Detention Center and was charged with Driving While License Invalid with previous conviction. On Tuesday March 10, at approximately 2:10 am, Deputy Greg Wilson made a traffic stop in the 600 block of Lincoln. The 46-year-old male driver was placed under arrest. He was transported to the Wichita County Detention Center and charged with three outstanding warrants for two counts of Expired Motor Vehicle Registration and Fail to Maintain Financial Responsibility. Deputies Villarreal and Barnett welcome their new partners to the Sheriff’s Office. 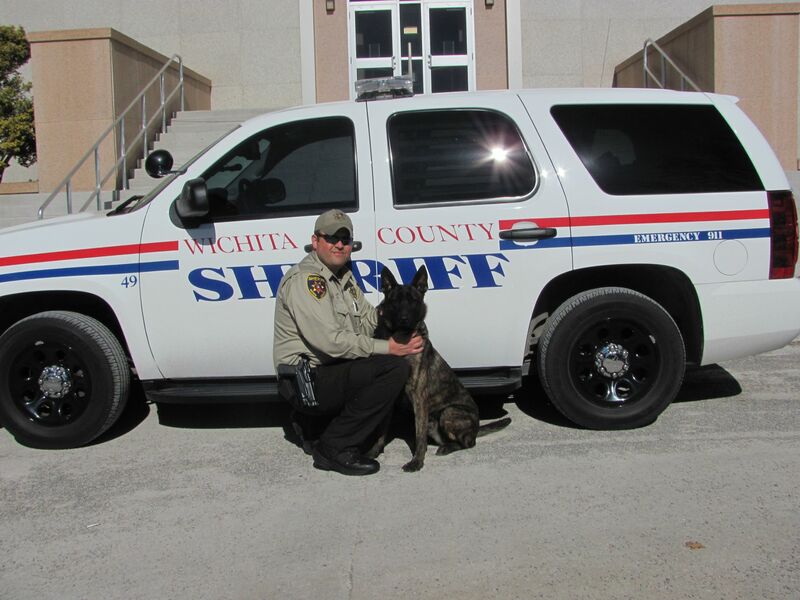 Deputy Cane and Deputy Able are both Dutch Shepherds. They are trained in searching for narcotics as well as fugitive apprehension. On Friday March 6, at approximately 5:46 m, Deputy Chris Barnett made a traffic stop at the intersection of Windthorst Road and Hatton Road. The 42-year-old male driver was placed under arrest. He was transported to the Wichita County Detention Center and was charged with three outstanding warrants for No Drivers License, Fail to Maintain Financial Responsibility and Violation of Probation. On Friday March 6, at approximately 1:30 am, Deputy Patrick Bradford responded to Huntington Lane in reference to a Theft. Upon arrival, the Reporting Person reported that an unknown person(s) entered the property and stole a blue Yamaha Badger four wheeler valued at$1,000.00. On Friday March 6, at approximately 2:07 pm, Deputy Eric Wisch and Deputy Kristian Valdez responded to FM 367 and Bridwell Road in reference to an Animal Complaint. Upon arrival, a horse was found out on the roadway. The animal was impounded after the owner could not be located. On Friday March 6, at approximately 3:12 pm, Deputy Ralph Burdick and Deputy Cole McGarry responded to Hy Bridges in reference to an Animal Complaint. Upon arrival, the Reporting Person reported that a dog appeared on his property. Animal Control was contacted and upon their arrival, the animal was impounded. On Friday March 6, at approximately 10:18 pm, Deputy Ralph Burdick made a traffic stop at the intersection of U.S. 287 and Peterson Road. The 24-year-old female driver and a 23-year-old male passenger were placed under arrest. They were transported to the Wichita County Detention Center. The driver was charged with Possession of a Controlled Substance PG 1 under one gram. The passenger was charged with an outstanding warrant for Possession of a Controlled Substance PG 1 under one gram. On Saturday March 7, at approximately 9:17 am, Deputy Victoria Hatcher made a traffic stop at the intersection of Barnett Road and Anchor Road. The 33-year-old female driver was placed under arrest. She was transported to the Wichita County Detention Center and was charged with an outstanding warrant for Capias Pro Fine-Driving While License Invalid. On Saturday March 7, at approximately 11:00 am, Deputy Victoria Hatcher responded to the 700 block of North Beverly in reference to a Theft. Upon arrival, the Reporting Person reported that an unknown person(s) entered the property and stole twelve Trojan Golf Cart Batteries valued at $2,136.00 and a roll of white sheet metal valued at $45.00. On Saturday March 7, at approximately 12:11 am, Deputy Todd Kinsey made a traffic stop in the 2900 block of Lexington. The 20-year-old male driver was placed under arrest. He was transported to the Wichita County Detention Center and was charged with Possession of a Prohibited Weapon. On Saturday March 7, at approximately 2:06 am, Deputy Greg Wilson made a traffic stop in the 1700 block of Maurine. The 23-year-old male driver was placed under arrest. He was transported to the Wichita County Detention Center and was charged with Driving While Intoxicated. On Saturday March 7, at approximately 11:26 am, Deputy Victoria Hatcher and Deputy Kristian Valdez responded to the 3100 block of Horseshoe Bend Estates in reference to a Medical Call. Upon arrival, an 81-year-old male expired of natural causes. On Saturday March 7, at approximately 9:38 am, Corporal Mark Whipple responded to the 600 block of Huntington Lane in reference to an Animal Complaint. Upon arrival, the Reporting Person reported that neighborhood dogs had killed four of his sheep. On Saturday March 7, at approximately 2:48 pm, Deputy John Warner responded to the intersection of 7th and Burnett in reference to a subject lying on the ground. Upon arrival, a 51-year-old female was placed under arrest. She was transported to the Wichita County Detention Center and was charged with Public Intoxication. On Saturday March 7, at approximately 12:15 pm, Deputy John Warner responded to the 1900 block of Huntington Lane in reference to a Theft. Upon arrival, the Reporting Person reported that an unknown person(s) entered the property and stole a Stihl 300 18” Chainsaw and case valued at $300.00 and one gallon gas can valued at $15.00. On Saturday March 7, at approximately 5:57 pm, Deputy Chris Barnett observed a subject riding a bicycle in traffic at the intersection of Kemp and Kell. The 35-year-old male was issued two citations for Fail to Yield at Intersection and Fail to Obey Traffic Signal. On Sunday March 8, at approximately 12:05 am, Deputy Gabriel Villarreal attempted to stop a vehicle at the intersection of Seymour Hwy. and Polk. The vehicle crashed out at the intersection of Ave. D and Fulton. The driver then fled the scene on foot. Deputy Villarreal was able to identify the driver. A warrant for Possession of Marijuana under two ounces and Evading Arrest/Detention with Vehicle will be issued. On Sunday March 8, at approximately 1:30 am, Deputy Greg Wilson made a traffic stop in the 1000 block of Monroe. The 20-year-old male driver was issued citations for no Drivers License and Minor in Possession. A juvenile female passenger, a 20-year-old male passenger and a 17-year-old male passenger were issued citations for Minor in Possession. On Monday March 9, at approximately 1:31 am, Deputy Greg Wilson made a traffic stop in the 1700 block of Central Frwy. Access Road. The 44-year-old male driver was placed under arrest. He was transported to the Wichita County Detention Center and was charged with Driving While License Invalid-Enhanced. The Sheriff presented deputies with awards and certificates during the first quarterly awards ceremony of 2015. Deputies were awarded for performing duties to the highest standard. It is because of outstanding officers like these that the Wichita County Sheriff’s Office is able to perform as well as it does in the community. On Tuesday March 3, at approximately 11:07 am, Deputy Victoria Hatcher responded to the 400 block of East Roosevelt in Electra in reference to a Theft. Upon arrival, the Reporting Person reported that an unknown person(s) stole a Topper Alumni-Lins Livestock Carrier valued at $2,000.00 from property located on County Road 277 between Flusche Road and County Line Road. On Tuesday March 3, at approximately 5:25 pm, Deputy Jeff Penney responded to the 8100 block of U.S. 82 in reference to a Disturbance. Upon arrival, the Reporting Person reported that there had been a verbal disturbance prior to Deputies arrival. On Thursday March 5, at approximately 9:17 pm, Deputy Cole McGarry made a traffic stop at the intersection of North Scott and 3rd. Street. The 25-year-old male driver was placed under arrest. He was transported to the Wichita County Detention Center and was charged with Possession of a Controlled Substance PG 3. On Friday March 6, at approximately 5:24 am, Greg Wilson made a traffic stop in the 2500 block of Central Frwy. Access Road. The 25-year-old female driver was placed under arrest. She was transported to the Wichita County Detention Center and was charged with two outstanding warrants for Capias-Surety Off Bond-Driving While Intoxicated and Surety Off Bond-Driving While License Suspended with Previous Conviction. On Monday March 2, at approximately 9:42 pm, Deputy Roy Biter made a traffic stop at the intersection of Martin Luther King and 6th Street. A male passenger exited the vehicle and fled on foot. A search of the area was made and the passenger was not located. On Monday March 2, at approximately 6:20 pm, Corporal Lee Crossman and Deputy Jeff Penney responded to the 1100 block of Pecanway in reference to the recovery of property. Upon arrival, the Reporting Person reported that he had located stolen property that was stolen in Burkburnett. The items were seized. On Tuesday March 3, at approximately 2:20 am, Lieutenant Patrick McFerrin made a traffic stop in the 1300 block of 6th Street. The 40-year-old male driver was placed under arrest. He was transported to the Wichita County Detention Center and was charged with Driving While Intoxicated. On Tuesday March 3, at approximately 2:31 am, Deputy Gabriel Villarreal made a traffic stop in the 1700 block of Seymour Hwy. The 28-year-old male driver was placed under arrest. He was transported to the Wichita County Detention Center and was charged with Driving While Intoxicated. On Wednesday February 25, at approximately 8:50 pm, Deputy Roy Biter responded to the 4600 block of Mistletoe in reference to an Assault. Upon arrival, the Reporting Person reported that she had been assaulted by a family member while at a residence located in the 3700 block of S.H. 258. On Thursday February 26, at approximately 3:30 pm, Deputy Justin Mitchell and Deputy Cole McGarry responded to the 9200 block of Sandy Road in reference to a Missing Person. Upon arrival, the Reporting Person reported that a 34-year-old male was missing. A short time later after Deputies had cleared the call, the male was located. On Friday February 27, at approximately 1:27 am, Deputy Todd Kinsey made a traffic stop in the 1700 block of Kell East. The 18-year-old male driver was placed under arrest. He was transported to the Wichita County Detention Center and was charged with Driving While License Invalid-Enhanced. On Friday February 27, at approximately 2:19 am, Sergeant Carl Magee made a traffic stop in the 3100 block of Lawrence Road. The 25-year-old male driver was placed under arrest. He was transported to the Wichita County Detention Center and was charged with Driving While Intoxicated.